A few months ago, my sister Miriam helped me reorganize my room. After sharing a room with 3, then 2, then 1 sibling, I got my own room when I was 13, and was so excited! Finally I could decorate how I wanted, so I painted the room pink and put up all the ballet stuff I'd been saving. A few months ago, we rearranged my furniture and made room for the sewing cabinet my parents generously got for me. Now I have a nice place to keep my sewing things in my room! Since my sewing machine and serger were now just sitting out all the time, I decided it would be a good thing to make slipcovers for them. I watched the fabric at Walmart for quite a while, trying to find the perfect, pretty fabric to use. I noticed the pink rose fabric when it was $2/yard, but put off buying it. A few weeks later, it was on the $1/yard table, so I quickly bought it, getting 5 yards of fabric for only $5! The slipcovers for my sewing machines; since I didn't use a pattern, they turned out a bit... interesting... but they work and keep the dust off! A curtain for my window; it lets in a whole lot more light than my long, filmy one did. A dresser scarf and ruffle for the my dresser; this dresser has gotten a lot of wear over the years, and the bottom drawer kept falling off, getting beyond repair. No problem - since I hang most of my clothes in the closet, I simply took out the drawer and use the space to keep my ballet and teaching supplies. A shelf runner and pillowcase for my bed; since my pink rose bedspread is a bit too much pink with the new pillow, I'm now on the lookout for a nice, white bedspread. Yes, as you've probably noticed, I like ballet, roses and pink! It's nice to have coordinating things in my room. I think this was the best use of $5 that I've ever made! I would like to ask for prayer for my hand. I sprained my wrist about 2 months ago and while it's healing, it still hurts on some days. I can only practice piano for so long and I have competition pieces to start learning. Also, with band and orchestra starting back, I'll be two days a week playing flute for an extensive period. A sprained wrist is every pianist's nightmare and it certainly has been that. So please pray for a complete healing of my wrist even with all these activities going on. A girl's emotions.... Up, down, high, low, topsy-turvy... It sometimes seems seems as though they're never the same! One minute you're happy, the next sad; one day you're sunny and bright, and next, dark and gloomy. God made us girls very emotional! Sometimes out of desperation we'd like to cry, "God, did you have to make us this way? I'd rather not feel at all then feel so strongly!" However, emotions are part of God's gift to us as women. The question is, what will we do with them? In one day we can go from being bouncy, upbeat, and somewhat hyper to being in the depths of despair! Some say that no one can really understand us women, which makes sense when we sometimes can't even understand ourselves! How are we to handle the wide range of feelings that get thrown at us? It's all too easy for us to use our emotions as an excuse, saying, "Well I'm just not feeling myself today," or "I know I shouldn't have been so harsh or crabby, but I'm tired and have worked hard all day!" You know what I'm talking about! I find myself using such excuses too often, then yet again having to bring my emotions, tiredness and hurt before the comforting Father, asking Him once again to give me His strength and love to carry me through. The online world; it's full of writings from a wide range of people about almost any topic under the sun. Browsing through blogs, you can read about one girl's new skill, another's accomplishment, and yet another's successful project. Rarely do you read about hard stuff, about when someone feels down or something flops. It can be good - after all, a blog really isn't the place to share all your woes! But, by just reading someone's blog, it's easy to come to the conclusion that they're perfect! Sometimes you begin to feel as though you can't measure up, especially after reading some of the wealth of things out there! However, let me remind you again: nobody's perfect. In reading my writings, you'll see my joy of journaling, joy of sewing, joy of cooking, joy of caring for children... you get the idea. While I'm glad that our blog can be an uplifting and encouraging place, I must be honest: I'm not always joyful. I have hard days and hard times; I feel downhearted and discouraged; I sometimes feel ready to quit... but in all theses times, His grace carries me through. It can be so easy to be hypocritical, writing one things about how we should live, then doing the exact opposite. I can enthusiastically talk about doing hard things, but do I do them on a daily basis? No, to be honest, I don't. It's a daily battle, dying to self. Even while writing this, Jubilee walked in and wanted my help with something yet again. I didn't want to get up, break my concentration, and help her; I wanted to stay in my comfortable position and scribble away, but I went. Other times, I'm not so helpful. Again and again I'm given the choice - how will I respond? For the most part, people would describe me as mature and stable, not prone to extreme highs or lows, but pretty constant. However, sometimes the way I present myself on the outside differs from the turmoil I feel inside. Not many know just how deeply I feel sometimes, just God, my journal and I fully understand. Yes, I am somewhat of a private person. =) When the weight falls on my chest, I try to steal away for a little while, seek precious solitude and write, read, and/or pray. Another knock on my door, another interruption. Irritation lurks below the surface as I try to answer nicely. There's daily tests of character, daily battles waged inside... Sometimes I win, sometimes I fail. Always, I'm grateful for the all-surpassing grace of my Lord. He is there to pick me up each time I fall and help me carry on. So be forewarned; the way my life looks through this blog is much nicer and more polished than the actual struggles day-by-day. I try to be sincere and honest, but it's more natural to share triumphs and encouraging happenings. So remember, often you're reading only one side of the story. I'm not perfect. Another thing to remember: what I write isn't perfect. I don't have all the answers, but I try to share out of my experiences. However, my experiences and opinions probably differ in some way from yours. I in no way have it all figured out! My prayer is that as you read, you'll see the faithfulness of my Father displayed in this life He leads me through. There are not many people that write letters anymore. With the wave of new technology and the online world, email is simply faster and more convenient. Yes, email is nice, and I'm very grateful for it, using it quite a bit! Yet, there's just something special about a real letter. Picture going to the mailbox: You walk to it (perhaps taking 15 minutes if you're walking, as it takes us) open it up, and flip through the stack, seeing bills, catalogs and automated mail.Then suddenly, you see a letter with your name on it! It makes your day as you eagerly open it and peruse its contents. Whether it's a note, card, or 5-page letter, you enjoy it completely, re-reading it again and again. You feel special that someone actually took the time to write to you! A letter can be such an encouragement to someone, and it really brightens their day. It doesn't have to be long or elaborate, though I do enjoy writing pages and pages sometimes! If it's from the heart, it will be so appreciated, even if it just tells about your day-to-day life. Letter writing can be a lot of fun! Yes, it takes more time, but it's also rewarding. Using pretty stationery or making your own, picking out a matching pen, and filling the page with neat script... It's a great way to spend a quiet moment. And unlike things on the computer, letters can be held in your hand and cherished for years to come. I'm blessed to have quite a few penpals. I write to Jennifer and Ella using both email and snail mail. Emails reach them much faster and is quicker when I just have to drop them a note, but on occasion I enjoy surprising them with a letter. I write to Anna and Brittany using just letters, keeping the postal service busy! When Elijah and Lydia are at college, I send them letters from home, making sure that there's something in their mailbox at least somewhat regularly. When I'm on trips, I write friends and family back home, letting them know what I'm up to. And sometimes I drop friends a note for no reason at all, just to let them know how special they are to me. Then there's the occasional letters sent to various people for various reasons - my pen isn't still for long! But doesn't that take a lot of time? Yes, it does somewhat, but it's worth it. Sometimes I write many letters in one afternoon (like the 7 I wrote yesterday), sometimes I just write a few over one week, fitting them in here and there whenever I have a spare moment. It's a nice break in otherwise busy days. And yes, unlike email, they do cost money to send. However, 41 cents is usually worth brightening someone else's days! Are you inspired yet? 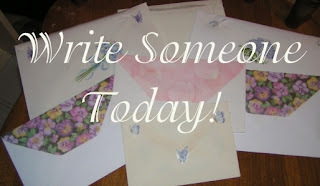 Take the time and write someone soon - a dear friend, old acquaintance, or family member that lives elsewhere. They'll feel loved and you'll enjoy doing it! Truly, letter writing is becoming a lost art. However, you and I can revive it! A handwritten letter is so special - and it helps if you want to develop neater handwriting as well! What better way to practice? Finally, the picture slideshow is up! GodTube had been having troubles, so I had to upload it 3 times before it actually worked. Since I'd already made this to play at the beginning of the musical, I thought I'd share it with you, changing it just a bit. Pictures are more fun to see in a slideshow! I hope you enjoy seeing the pictures! Thanks so much to Miriam, Elijah and the Harts for taking the pictures and Lydia for allowing me to record her playing Hava Nagila for the background music. She plays the violin beautifully! With the musical behind us now, I can start looking forward to our musical activities resuming (actually, I've been looking forward to them all summer!). 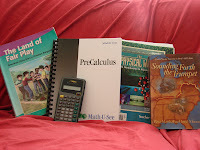 I started back some of my school two weeks ago and am going to start working the rest of it in these next two weeks. All of our music activities, like band, choir, and orchestra begin in the first week of September. So does Anna's ballet class, which I will be taking again this year. It was rather strange last year, taking lessons from my closest friend, but fun as well. It's fun to be able to dance with Anna now. We've already done two duets together. We were almost without a band director this year, but we have a new one. It should be interesting. This will be my third band director in the years I've been with the band. I'm looking forward to the change, though I will miss our last director. The Lord knows best. The practices are closer now, which is a blessing. Anyway, I know this isn't much, but I wanted to let everyone know that I'm still around. Just really busy. I hope to be writing more often. As I contemplate the past 5 weeks of practice and preparations for Ruth - From Rejection to Redemption, one thing stands out: God's faithfulness to bring everything to completion. The rehearsals weren't easy - I don't know how trying to keep track of 29 other people's parts in addition to acting myself could be! - but God gave us the strength to get through it all successfully. However, I couldn't have done it alone. In addition to God's help, many others generously gave of their time and energy. This musical was definitely a family affair, with everyone involved in some way, and being so supportive! They were the first to read the musical in it's various drafts and give me pointers here and there. Mom especially helped in editing it, then helping me plan to produce it and inviting people. Once rehearsals began, everyone did some part: Dad played Boaz, doing a great job learning his long lines and dancing parts even though he has a hard time in memorization. Mom helped with nearly everything, watching all the rehearsals and giving pointers, proofreading emails and the program, advising in costumes and stage design, helping publicize it, and so much more! Miriam ran sound primarily and helped with lights, also locking up several times for me, as we used the building of the church she attends. Lydia worked during most of the rehearsals at her summer job, but finished the week before the musical, taking over running the lights and playing beautiful Jewish violin music during the bows at the end. She was also such a servant in helping to clean up. Elijah filled in running the sound when Miriam couldn't make it, took pictures, and videotaped the presentations. Jubilee did a great job playing Tamar, a haughty servant girl of Boaz, a fictional character used to enhance the story. She also put up with all the early times we had to go to practice, helping to clear off the stage and set up props, then sitting down with a good book to pass the time. I truly couldn't have made it without my family's help! Other families helped as well - giving so generously! The Hart family was very involved in it all, helping with costumes, props, and whatever else they could, in addition playing many characters. Mrs. Lavonne was my wonderful stage manager, sacrificing being able to watch the performances and instead keeping order backstage. Mr. Rob was the best assistant director, not afraid to remind us to be loud and helping with being expressive. So many other families helped as well with costumes, props, stage, and backstage... I am so blessed to have been able to work with such a great group! And then, the presentations were done on Friday and Saturday. They went so well, praise God! Everyone portrayed their characters so well, getting into the mood and remembering their lines and cues. The dances and songs were beautiful - I was blessed to work with so many talented young people! The 3 Elders behaved themselves quite well, though we caught some funny shots of them for our bloopers clip, filmed a week ago Saturday. Three dads of children in the play, they kept us laughing. =) All-in-all, the presentations went quite smoothly, everyone finally remembering all the entering and exits and where to stand. Voice projection and facing the audience was stressed over and over during practices, and everyone carried it out quite well during the performances. We got to use sweet Weston, Miriam's nephew as Obed for the first night, and it was so much fun to be able to use a real baby rather than a baby doll! Everyone's costumes worked out well, though we had a few minor veil problems - I just wonder how they kept the slippery things on in Biblical times (we tucked ours into headbands). Praise God for two successful presentations! I'm so grateful for all of your prayers - they helped a lot! We had a pretty good turn-out for both presentations, and the audience really seemed to enjoy the musical. So many people remarked on what a good job it was, which was a great encouragement. As was our prayer, it seemed to bless many people. We had a cast party on Saturday evening, then it was good-byes for a while. You grow pretty close after working so hard together... It was such a wonderful group! Thankfully, I'll see most of them regularly, with quite a few taking my ballet classes this fall. Yes, it is a relief to have it all over with; I no longer have so many details flying through my head, and I've got a chance to get rested up, but I shall miss it. Despite the hard work, it was loads of fun, and though exhausting, it was so enjoyable. Everyone asked when I'd do another musical, then seemed disappointed that it probably wouldn't be before next summer, due to busy schedules during the year. It would be fun to do one before a whole year has passed, but we'll see... We need to recover from this one first! "To God be the glory! Great things He has done!" 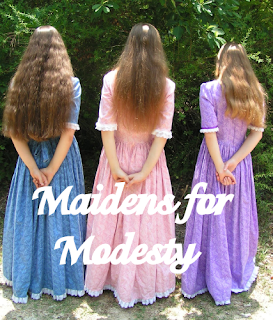 As maidens, it can be very hard not to stereotype what modesty is or should be. We might look at a girl wearing capris and say, “she isn’t in a skirt of dress; therefore, she isn’t modest.” Or we can see along jumper and naturally assume the wearer is modest. We can make these same judgments in relation to hair, shoe height, even length of other garments. However, there is more to modesty than just dress code. In fact, the Bible never says how long a maiden needs to wear her hair or skirts. To Christ, the dressing of a person’s heart is of far greater importance than the dressing of a person’s body. 1 Peter 3:3-4 read, “Do not let your adornment be merely outward—arranging the hair, wearing gold, or putting on fine apparel—rather let it be the hidden person of the heart, with the incorruptible beauty of a gentle and quiet spirit, which is very precious in the sight of God.” Now this verse doesn’t mean a maiden cannot look nice. In the Bible, we see that Esther went through beauty treatments, Ruth anointed herself before going to Boaz on the threshing floor, and the Proverbs 31 woman was arrayed in fine linen and purple. The Lord has taken the time to mention these “styling sessions,” so it obviously mattered to Him that we know what women wore. However, what was their heart wearing? We find Esther obeying what Mordecai and the king’s eunuchs instructed. Ruth cared about Naomi’s future, and the Proverbs 31 woman was the picture of servanthood and love. And when we read these women’s stories, it is their character qualities that leave an impression, not in what they are clothed. Besides 1 Peter, there are other verses that show God’s instruction for maidens. Titus 2:5 is a good one. Among other exhortations, a maiden was told to be “discreet.” So, by using discreet, quiet and meek from other Bible translations, we can see that a maiden is one who does not draw attention to herself. Instead her actions speak and proclaim who she is. A young woman who might be dressed in decent, not form fitting capris, and yet is loving, compassionate, and self denying more readily fulfills God’s design than a long-skirted maiden who is harsh, lazy, and self-serving. In all actuality, the skirted maiden in this case is really no different than a person in a provocative miniskirt. So, what is modesty? To me, it is a maiden who yes, has certain neckline and length requirements, but is more concerned with lining up her life to God’s plan and following His path. It is hard to do the latter, perhaps even harder than finding clothes. =) Our flesh seeks to get its way and the attention. When in a room of people, it is far easier to be the one whom everyone notices than it is to have a deep conversation with one person. It is a daily, hourly, minutely, battle to die to one’s self, but by God’s strength, we can! We have only to ask! I am far from being a truly modest maiden. Sure, my clothes might be fine, but my heart isn’t always “properly attired.” Perhaps you feel the same way? I want to encourage you (as I remind myself) that God is only a prayer away. When it seems so difficult to have that right attitude, or to play with a sibling when a book is beckoning us, let’s cry to Him. God will take us through the “Refiner’s Fire” as we humbly seek His face. May we become maidens whose outfits, and actions, leave an indelible mark that future generations remember, just as Esther, Ruth, and Proverbs 31 do for us today. May we strive to never stereotype modesty by a person’s attire anymore. Instead, may we remember that there is more to modesty; may we look at the heart before we are quick to judge! Original post found here. This post ties in perfectly with the posts we've done about modestly recently. It's a wonderful reminder to be discreet and modest in actions as well as dress. Ella is a maiden who blogs over at How Great is His Faithfulness! She is 17 years old and committed to modesty, courtship, and seeking God's best for her life. She has a heart for ministering to young ladies, through her blog and as an editor for HopeChest magazine. Her prayer is that through her blog, you will be able to see the Lord lifted high. I have known Ella for over a year now, and we've been penpals for almost as long, writing good, 0ld-fashioned letters as well as emails. She's been a constant source of encouragement for me, and has always inspired me to press on in my daily walk. She's truly a "sister", though several states away! I'd highly encourage you to check out her beautiful blog, and leave her an encouraging comment. I enjoy enjoy reading what this lovely writer has to say, and I'm sure that you will as well! Last month, I came home from dance camp to learn that Jubilee's dog Sox was missing. He was only around 2 years old, and she'd trained him to be a very good, obedient, and gentle dog. We miss him a lot, but after realizing that he probably wouldn't be found, Jubilee began to want another dog. Soon, another sign appeared near the one we'd put up for lost Sox, this time saying that someone had found a puppy. After he wasn't claimed by anyone, Jubilee and mom went to pick him up today. He's definitely part Chow (as Sox and our other dog Midnight is), and we think part Lab or Golden Retriever. More than that, he's extremely cute! Jubilee named him Orius, after the centaur in The Lion, the Witch, and the Wardrobe. She's definitely a huge Narnia fan! Jubilee spent the afternoon playing with Orius, and introducing him to our menagerie of 1 dog and 6 cats (not to mention 2 birds and 2 fish!) and exploring with him the great outdoors that he'll now call home. Jubi loves animals, and I look forward to watching her train this sweet puppy!